VIII is the story of Henry VIII, the Tudor king best known for having six wives and separating from the Roman Catholic Church to create the Church of England. There have been many books written about the life of this famous monarch, but VIII stands out for a few reasons. Firstly, it is written for young adults. As such, much of the story deals with the life of Henry when he was a young boy, Hal the Duke of York. This insight into Hal the boy and his upbringing teaches us a great deal about the reasons Henry became such a monstrous ruler. 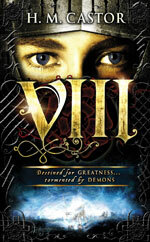 Written in the first person, VIII deliberately provides insight into the mind and thought processes of Henry VIII.Much of the plot revolves around a prophecy Hal hears as a boy, and his lifelong quest to prove the veracity of this prophecy. The novel thus evolves into a tale of mystery and suspense, leaving the reader guessing until the very end. For history buffs, VIII provides a scintillating journey back to Tudor times with powerful portraits of the main players of the era. Meticulously researched by the author, the reader can have confidence in the historical accuracy of this tale. The tournaments described by Castor actually took place, the objects mentioned are historically correct and many of the conversations worked into the dialogue have come from historical documents. I still not sure how much I like the adult Henry, but I really adored young Hal, his spirit and bravado. It is clear that Hal’s childhood experiences created the insecure, irrational and power hungry man who became King Henry VIII.